A lot of people are using pixels these days, so I designed a small PCB (38mm x 51mm) so they could add 3 channels of DC control and drive it from their pixel controller. This board accepts pixel data in the WS2801 format, so for example could be added to a mega tree to add a star topper made from “dumb” DC strip or other lights. You can continue the pixel signal onto more pixels (or another one of these boards) using the other 4 pin connector. I have provided a jumper to separate the pixel V+ from the DC output V+. This means you can use these boards on 5V pixel systems and still have 12V DC outputs with no issues. You will need to provide a 12V power source of course. The LPD6803 version is almost identical. 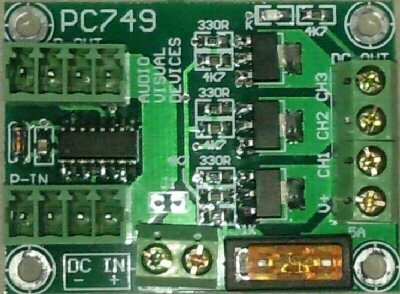 The board’s outputs are driving a set of 12V “dumb” (no IC) RGB modules. Pixel data is being fed into the board from one of my small P-DMX pixel controllers. 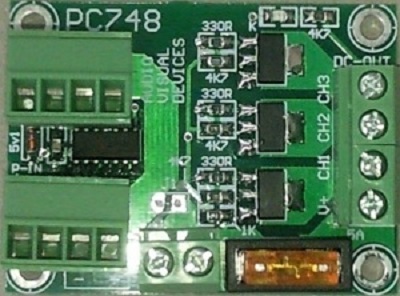 The incandescent lamp is connected to one of the board’s DC outputs. Pixel data is being fed into the board from one of my small P-DMX pixel controllers.